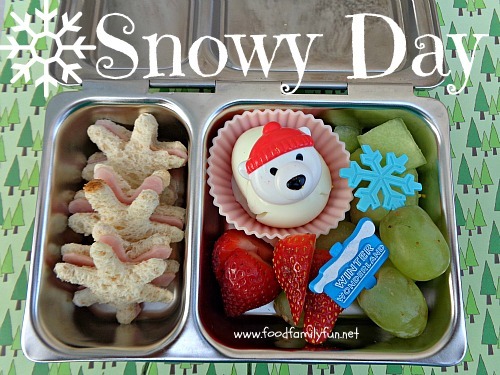 The only Snowy Days around here are in the girls' lunches! There was a slight chill in the air last week but of course it doesn't snow here in Bermuda. 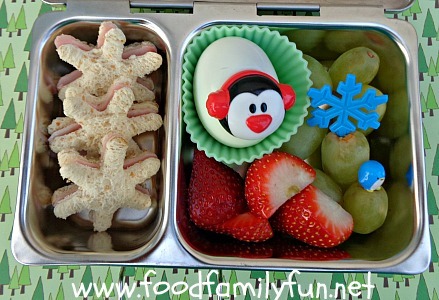 I packed identical snow themed lunches for the girls. School is out so no more packing lunches for a while. 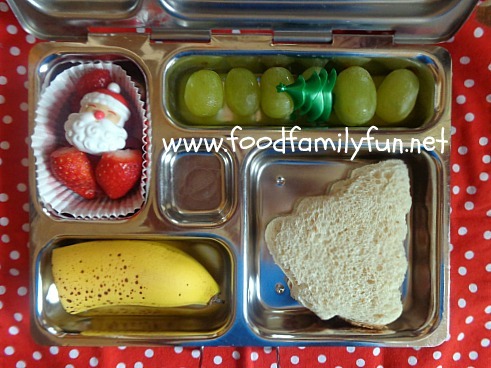 The girls had mini snowflake shaped ham sandwiches, a boiled egg, strawberries, grapes and one lunch got the last few pieces of honeydew melon. Wouldn't you know, as I finally post these lunches today it turned out to be a really hot and beautiful day! We spent lots of time outside in the sun, quite a contrast to the snowy day theme. The next few days will be busy in our household with some last minute shopping and gift wrapping. Little Emily has so kindly unwrapped a bunch of our presents that were gifts for her cousins! What a rascal. We will make our Gingerbread house and bake some cookies for Santa. Since I am still a bit busy with work I have put together some Christmas themed fun work binders for the girls. They were super excited when they saw me putting them together so I think that they will enjoy them. Hopefully when Emily naps in the afternoons they can work on their binders and I can get most of my work done. That's my plan anyway! I found lots of printables online and didn't have to create anything myself. Check out my Pinterest Board for ideas if you would like to setup some fun work for your little ones. Jolly Holiday - fun blog hop. As mentioned last week I am joining in on another blog hop with the Bento Bloggers and Friends. There are actually 4 hops in total this year. I have only joined in on the middle two, the last one will be on Dec 19th. You can find links to them all here. This is Amy's Jolly Holiday lunch. Amy has the jolly old man himself for lunch. 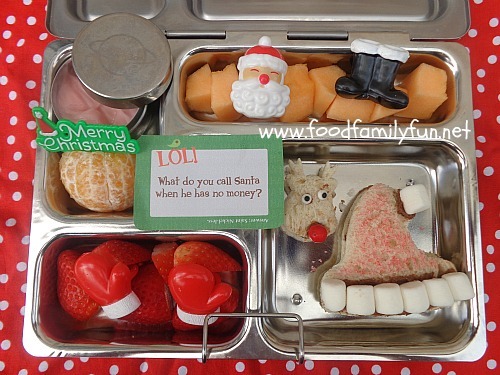 Her sandwiches are chocolate and peanut butter spread shaped like Santa's hat and his best reindeer pal, Rudolph. She has lots of fruit - half a clementine, strawberries and cantaloupe. Trix yogurt and greek yogurt combo complete her lunch. It was time to grocery shop so we were out of all of the raw veggies that she likes. 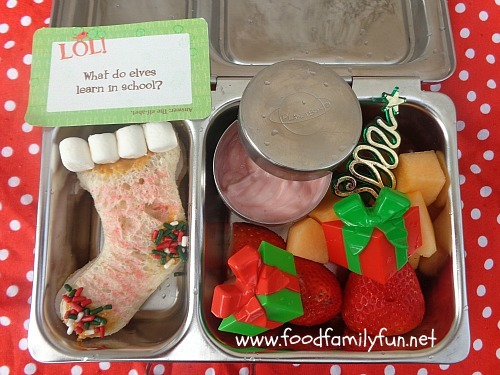 I have continued to pack the LunchBox Love FREE printable holiday jokes. The kids are loving these jokes. Q: What do you call Santa when he has no money? Now on to the fun holiday blog hop. Click the button to hop on over to Bento Days to see what Jean has made. There are 15 blogs to hop through. When you hop back to me you will have seen them all! 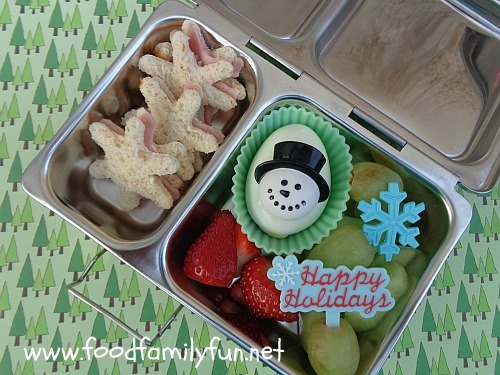 A cute little holiday fun lunch for Heidi. Turkey sandwich shaped like a stocking with mini marshmallows and sprinkles, trix cherry yogurt and greek yogurt mixed together, cantaloupe & strawberries. I also packed her a banana on the side. You might notice that I have been mixing trix yogurt and greek yogurt together lately. The girls love the trix yogurt and I like the extra protein and less sugar in the greek yogurt. Plus is makes it just a little thicker and less likely to make a mess when they are eating. Perfect combo for school! Inside Heidi's lunch is a little holiday joke. It also came from the free printables set on LunchBox Love that I posted yesterday. Here's that link again. Q;What do elves learn in school? You might notice a couple of raindrops on Heidi's lunch. I like to take my photos outside when I can and I almost made it in time! A surprise sunshower came over just as I was taking the photo. I quickly snapped the picture and ran inside, lunches in tow. There were hardly any rain drops on her lunch so it worked out ok.
Today I am joining in on a blog hop with the Bento Bloggers and Friends. There are actually a series of holiday hops this month. Stay tuned as I will be participating in another hop next week! For today's hop I made a fun Gingerbread People themed lunch for Rosie. Tonight we are going to have a gingerbread cookie baking evening in our house. It seems like everyone needs to bring cookies for something tomorrow! We're going to go with gingerbread people. Amy has to bake and decorate a bunch for her Brownies party as part of her cooking badge. I expect that we'll all have some fun in the kitchen. I"ll try to snap some photos to share. For lunch Rose has greek yogurt & cherry trix yogurt mixed together, half of a clementine, cantaloupe, strawberries, and a marshmallow gingerbread boy. Her sandwiches are her favourite chocolate & peanut butter (who wouldn't like that?) filling. I cut them into the shape of girl and boy gingerbread people. I tucked a fun joke in her lunch. These jokes are free online printables from Lunchbox Love. You can find them here. The joke Q: What did the gingerbread man put on his bed? A: a cookie sheet! haha. Kid's humour, I love it and I know that Rose and her friends will too! 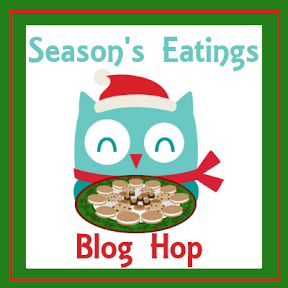 This post is part of the Season's Eatings hop. 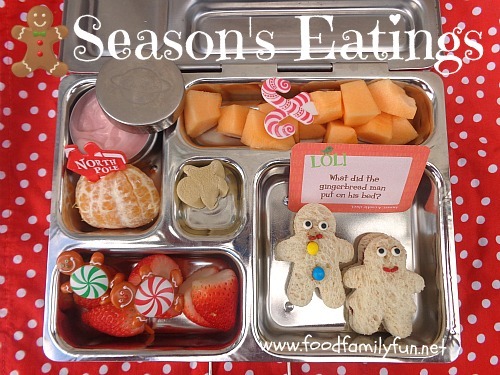 Click the button below to hop on over to Student Bento to see what eatings Stacey has made for the Season ^_^. There are about a dozen or so blogs participating. When you hop back to this post you will have seen them all. Enjoy! My mojo has been lacking lately. I have been making lots of healthy lunches, they've just been a little low on flair. Here are some recent lunches. 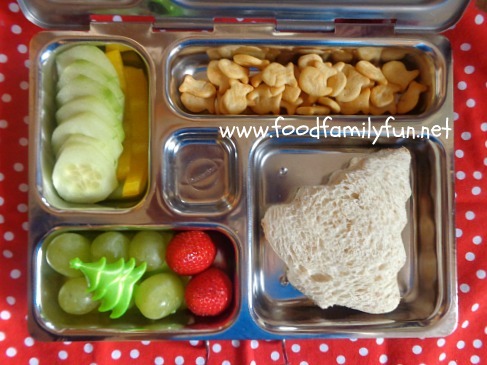 All of the girls had similar lunches, keeping it easy for me! 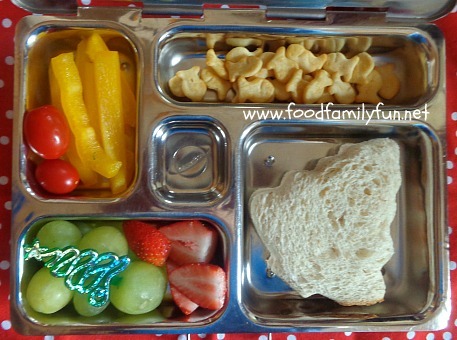 Rosie has yellow peppers & grape tomatoes, green grapes and strawberries, goldfish crackers and a tree shaped sandwich. There are slight differences in the lunches as their favourites are different - banana is one of Heidi's favourites, cucumbers are one of Amy's favourites (she would never eat a banana! ), bell peppers of any colour are definitely Rosie's favourite item in her lunch. So even though these are mostly the same they were each happy to have one of their favourites for lunch. Almost everything was eaten. Rose left a bite of sandwich and Amy left the peppers. It was a trial, she still doesn't really like them. And is case you are wondering what happened to the other half of the banana - baby sister Emily ate it for breakfast. She LOVES bananas too.